THE consumer rights crusades of Ralph Nader during the '60s and the '70s had the us government running around in circles. No wonder alarm bells have been ringing ever since Nader announced plans to take on the us President Bill Clinton from the left as a Green Party candidate, in Califorriia's election primaries this month. Nader's name has become synonymous with the consumer movement in the us ever since he bur 'st onto the national scene in 1965 with his hardhitting book, Unsafe at any Speed: The Designed-in Dangers of the American Automobile. The book accused us automakers of knowingly producing unsafe cars, and led to the framing of the National TrafEc and Motor Vehicles Act. Since then, due to his relentless campaign, dozens of laws have been put on the statute books, ranging from the Consumer Product 'Safety Act to the Freedom of Information Act. Air bags, which he pushed for years, are now standard in American automobiles, as are safety belts. Nader became a folk hero when General Motors - which he denounced for ignoring serious design flaws in its Chevrolet Corvair - hired a private detective to sleuth about his private life. In 1970, he eventually received $425,000 as settlement for an invasion of privacy lawsuit, which gave a boost to the fledgling consumer movement. Since then, -over the years, Nader has created a network,of over 60 groups. The launching pad was Nader's main organisation, Centre for the Study of Responsive Law, which he founded in 1968. The Centre seeks to create awareness about consumer and environmental issues, and, conducts'research and edu@ational projects to'encourage public and private institutions to be more responsive to the needs of citizens and consumers. Creation of other organisations followed: Public Citizen, an umbrella organisation, which includes Congress Watch - a congressional lobbying group, Health Research. group - a medical watchdog organisation and the Centre for Science in Public Interest. Says Nader in his first anti-establishment salvo, "The people need more political choices and less cynical posturing. Both the Democrats and the Republicans refuse to change, won't give up the special interest money, won't reform and give the people more power. This campaign isn't about me becoming President, it is about getting a new political movement going for the long haul." Political observers agree unanimously that Nader will sail through the California primaries. Paving the way for a victory are his high profile consumer campaigns, his positive ratings in the polls and his support for Green causes like demands for a cleaner environment, the reining in of big money, special interests and a more equitable distribution of the nation's jobs and wealth. But not many expect him to get California to rally behind him on November 5, leave alone any of the other states where he may run as a candidate. These include Colorado, Maine, Rhode Island, Minnesota and Pennsylvania. The Greens' emphasis on democrdcy puts another question mark over Nader's political future: even if Nader wins the primaries, a majority of his party leaders still have to nominate him for the November elections. But the real significance of Nader's possible candidature may lie in the element of uncertainty that it has introduced into the general elections. One outcome foreseen by political experts is that it could take away some wavl;ring. Democrats from President Clinton and herald in victory for a Republican. Bill. Press, chairperson, California Democratic Party, echoes the fears of several Democrats when he asserts, 'A vote for Ralph Nader this fall would be a vote,for Bob Dole, and can't really believe that's -what Ralph and -the Green Party want to accornplish." Nader definitely has the potential to woo disenchanted Democrats who, like him, believe that Clinton is responsible for a number of sell-offs: signing of the ineffective North American Free Trade Agreement, ending the 55-mile-an-hour speed limit for automobiles and' refusing to push for stringent Congressional reforms. Says Nader. about Clinton's approval of a bill to end the federal 55-mile-an-hour'speed limit; "President Clinton will have a very, black mark on his record because of that signature." 'Another possibility foreseen is. that Nader's candidature could force Clinton to tilt leftwards to prevent the exo dus of disgruntled Democrats. Already, Clinton has drawn up strategies to stave off the challenge from the left by protecting Medicare and other social programmes against the budget-axing measures prescribed by' the Republicans. He has also vetoed bills that the Republicans sought to push, which included slashes on Environmental Protection Agency fundings. Despite his high-profile successes, Nader's career graph is not without occasional flops. 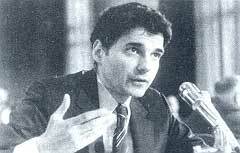 In 1978, Nader and a coalition of consumer groups lobbied for the creation of a Cabinet level department - the Federal Consumer Protection Agency - to protect consumer rights. In a major setback to Nader, the legislation was defeated. Ironically, some of his successful causes have become pass&.air bags are now 'standard equipment' in American automobiles, the Freedom of Information Act is now an integral part of investigative journalism, and a tough bill to register Washington lobbyists glided through the Senate on a 98-to-O vote and the House by 421 to 0. For-political observers, the major question right now is just how dangerous Nader is for Clinton. "We recently did a theoretical race between Clinton, Dole and Nader, and Clinton- still came out ahead," says Mark DiCamillo of Field Poll, one of California's most respected survey groups. "Nader seemed to draw most heavily from people who had already abandoned Clinton and Dole, too, for that matter." Some indication of the votes that Nader might garner was provided by another California poll that gave him 11 per cent support in a three-way race with Clinton and Dole. Nader himself - remains upbeat about -his political chances. "I offer an alternative that, can't easily be ignored," he points out. "People already know what I stand for, and the med@a is good about giving me access. I think that wig be sufficient to get this movement going." However, Green Party representatives - over 100,000 members in California alone - have their I own apprehensions about the forthcoming elections. Some members fear that a favourable showing by Nader might help put a Republican in the White - House, thus proving counterproductive.. They would much rather that Nader uses his candidature,a@ a means t6'push Clinton leftWards. @ They would also like the party to concentrate more'on running local and state candi-7 dates, a means to construct a grassroots base. "There is not a 100 per cent agreement on what we should be doing," says Michael twombly, a Sacramento lobbyist, long active in the Green Party. However, the Green Party has its own limitations: it is little known nationally and has a miniscule political basei attracting less than one per cent of the registered voters in California. Although the early portents are that the Republicans could stand to gain from Nader's candidature, all is not hunky dory i 'n their camp either. Surveys in California and elsewhere indicate that Republicans have reason to be wary of a third' party candidate this yean Thf! Perot vote may have enabled the Republicans to gain the critical edge in the 1994 Congressional elections, which led them to take over both the Senate and the House - for the first time in 40 years. However, given the waning influence of the Republicans, if that vote goes elsewhere, Republican candidates @ including their presidential candidate - might have to pay a heavy price.